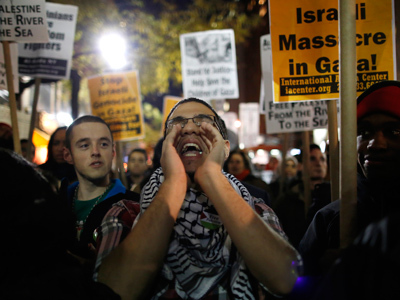 Israel’s airstrikes on Gaza have sparked global protests condemning the attack. Thousands of people across the Middle East, the West, and Europe have come out to show their disdain. Yet, some countries remain convinced of Israel’s right to attack. Israel’s Operation Pillar of Defense – which began Wednesday and has taken the lives of 39 Palestinians and three Israelis so far, according to Palestinian local media – has divided the international world. In the West Bank city of Ramallah, more than 1,000 people have gathered to show their support for Gaza. In Lebanon, thousands turned up in Palestinian refugee camps in the north and south of the country to show their outrage on the Israeli violence, shouting “O Qassam, O beloved, bomb and destroy Tel Aviv,” referring to the rocket and the armed wing of Hamas of the same name. In Iran, over 700 cities saw anti-Israeli protests after Friday’s prayers, including Tehran. Crowds there were chanting “death to Israel” and “death to America,” ISNA news agency reported. Arabs from East Jerusalem also rioted, throwing stones at security officers, blocking roads and setting off fireworks near the hospital in Isawiya, according to Algemeiner news. The international community has been coming together to offer solutions to the crisis. Foreign ministers of Arab League countries are gathering on Saturday in Cairo for an emergency meeting to outline a consolidated position on the ongoing Israel's offensive in Gaza. The UN’s Security Council held an emergency meeting on the conflict. After the meeting UN has urged for the violence in Gaza to stop. However, no other substantial solutions were reached due to disagreement between member states. Further, UN Secretary General Ban Ki-moon made a statement Friday telling both sides “to stop this dangerous escalation and restore calm,” and announcing his plans to visit Israel and Egypt next week. Also, Tunisian Foreign Minister Rafik Abdessalem has arrived in Gaza on Saturday along with 12 other ministers. This trip comes after the Egyptian Prime Minister Hesham Kandil’s visit to the region Friday. During his visit, Kandil tried to broker a new longer-lasting ceasefire. He took a strong public pro-Palestinian stance. “What I am witnessing in Gaza is a disaster and I can't keep quiet. The Israeli aggression must stop,” Kandil stated. 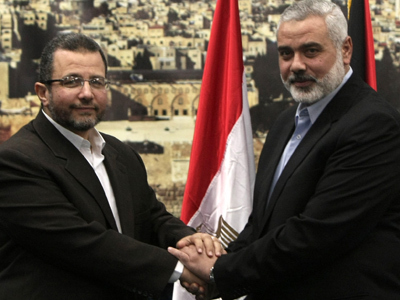 “Egypt supports the Palestinians, Israel’s actions will not go unnoticed”. The Western world also saw protests Friday. In Rome, an anti-Israeli sit-in was organized in the Italian parliament. Organizers have called upon the international community to put an end to the massacre of Palestinian people in Gaza and to stop the “Israeli war-machine”. The cities of Venice, Palermo, Ravenna and Trento have joined Rome and carried out demonstrations of their own. Earlier demonstrations were held in New York, Paris, and Sydney calling for an immediate end to the attacks on Palestinians. However, Western governments have not been as sympathetic to the plight of the Palestinian people as their citizens, emphasizing Hamas’ fault and Israel’s right to self-defense. US President Barack Obama has reiterated US support for Israel's right to defend itself on Friday during a call with Israeli Prime Minister Benjamin Netanyahu. The EU has followed in US’ footsteps. European Union foreign policy chief Catherine Ashton made a statement Friday saying that "Israel has the right to protect its population from these kinds of attacks. I urge Israel to ensure that its response is proportionate." And Germany's Chancellor Angela Merkel also announced Friday that she holds Hamas responsible for Gaza violence and that Israel has the right to defend itself. The UK took a similar position when Prime Minister David Cameron told Israeli PM Benjamin Netanyahu that Hamas "bears the principal responsibility" for the violence in southern Israel and Gaza. Israeli airstrikes on Gaza are entering their fourth day and further escalation of the conflict is feared, as ground Israeli invasion looms. 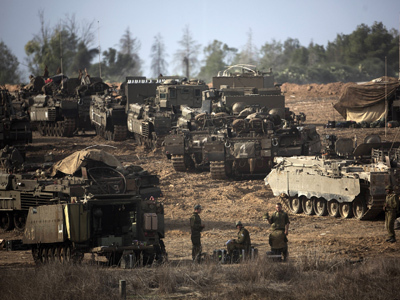 Senior members of the Israeli military have announced that troops have been ordered to prepare “to the highest state of readiness” and are to expect to invade Gaza this weekend. Also, on Friday country’s cabinet has approved the draft of 75,000 army reservists for ground operation. 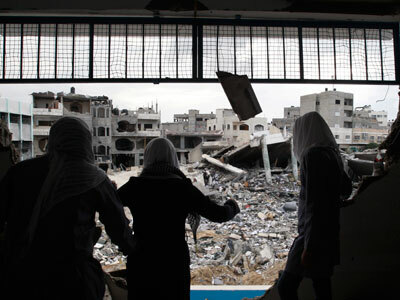 So far, Israel has hit over 500 targets, killing 39 Palestinians, including dozens of civilians and wounding over 300.